With more and more websites powered by AJAX, it has become increasingly important that a site be able to load data asynchronously. This means that page elements are rendered in the background in real-time with no perceptible delays or page loading. Due to the popularity of social media, many sites now seek to feature content produced offsite, by other sites like Flickr or Twitter. Although these sites provide an RSS feed allowing their content to be imported, there's a problem. AJAX only allows server-side requests from the same domain that it's hosted on. JSON addresses this issue. 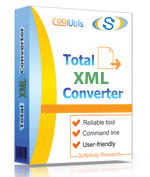 If you want to get JSON files out of your XML ones, try Total XML Converter. It converts XML to JSON and other formats; either one file or a bunch of them.